This is a guide describing how to deploy AsterixDB onto a YARN-based environment. Node-local destinations not managed by YARN, but which are accesable by the container and live beyond its termination. AsterixDB uses only the last type of storage, which is available with both the DefaultContainerExecutor and LinuxContainerExecutor. However keep in mind that with the DefaultContainerExecutor, the directory must be accessable by the same process that the YARN NodeManager is running as, while with the LinuxContainerExecutor it must be accessable by the unix user who is running the job. For this tutorial it will be assumed that we have a YARN cluster with the proper environment variables set. To test this, try running the DistributedShell example that is distributed as part of Apache Hadoop. If that sample application can be run successfully then the environment should be acceptable for launching AsterixDB on to your YARN-enabled cluster. remote: Counting objects: 490, done. remote: Compressing objects: 100% (315/315), done. Receiving objects: 100% (490/490), 521.34 KiB | 201.00 KiB/s, done. Installed the plugin 'vagrant-hostmanager (1.5.0)'! Then start the tutorial cluster. The hostmanger plugin may ask for sudo at some point, because it updates your hosts file to include the virtual machines. To deploy AsterixDB onto a YARN cluster, we need to construct a configuration file that describes the resources that will be requested from YARN for AsterixDB. This AsterixDB cluster description file corresponds to the above deployed scenario. In this example we have 3 NCs and one CC. Each node is defined by a unique name (not necessarily hostname) and an IP on which AsterixDB nodes will listen and communicate with eachother. This is the ‘cluster_ip’ parameter. 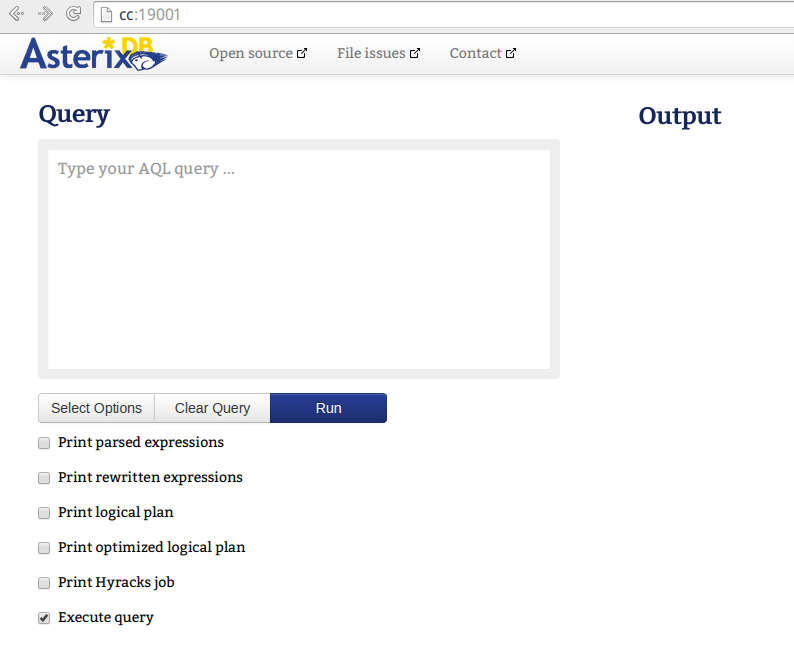 The ‘client_ip’ parameter is the interface on which client-facing services are presented, for example the web interface. For the next step this file will be saved as ‘my_awesome_cluster_desc.xml’ in the configs directory. Waiting for new AsterixDB Instance to start  . Asterix successfully deployed and is now running. Once the client returns success, the instance is now ready to be used. We can now use the asterix instance at the CC’s IP (10.10.0.2), on the default port (19001). From here, to try things out we could run the ADM & AQL 101 tutorial or any other sample workload. Waiting for AsterixDB instance to resume . AsterixDB’s YARN client is based on static allocation of containers within Node Managers based on IP. The AM and CC processes are currently not integrated in any fashion. The asterix command itself is simply a wrapper/launcher around the AsterixClient java class, that provides time-saving default parameters. It is possible to run the client directly with java -jar given the correct options as well. kill Forcefully stops an instance by asking YARN to terminate all of its containers. Configuration Path -asterixConf -c -c [/path/to/file]. 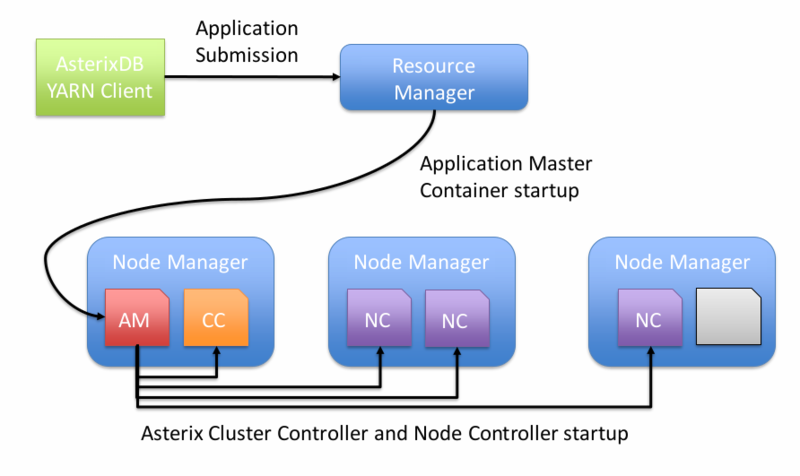 Path to an AsterixDB Cluster Description File Only required with create . A configuration in DFS defines the existance of an instance. Force -force -f -f. Use at your own risk. Disables any sanity-checking during an action. Can be applied to any action, but is mostly useful in cases where an instance cannot be removed properly via destroy and cleanup of DFS files is desired. Refresh -refresh -r -r. Replaces cached binary with one mentioned in -tar. This only has an effect with the start action. It can be used to replace/upgrade the binary cached for an instance on the DFS. Base Parameters -baseConf -bc -bc [path/to/params]. Specifies parameter file to use during instance creation/alteration. This file specifies various internal properties of the AsterixDB system, such as Buffer Cache size and Page size, among many others. It can be helpful to tweak parameters in this file, however caution should be exercised in keeping them at sane values. Only used during alter and create. External library dataverse. -libDataverse -ld -ld [existing dataverse name] Only used in libinstall. Specifies the dataverse to install the library in an -l option to. Snapshot ID -snapshot [none] -snapshot [backup timestamp/ID] Used with rmbackup and restore to specify which backup to perform the respective operation on. Q: Where are the AsterixDB logs located? A: YARN manages the logs for each container. They are visible in the YARN Resource Manager’s web interface or through the hadoop command line utilities ( see http://hortonworks.com/blog/simplifying-user-logs-management-and-access-in-yarn/ for more details). Q: Why does AsterixDB fail to start, and the logs contain errors like ‘Container is running beyond virtual memory limits.’ ? A: This is a quirk of YARN’s memory management that can be observed on certain operating systems (mainly CentOS). It is benign unless it causes problems of this type. A work around is to set yarn.nodemanager.vmem-check-enabled to false in the yarn-site.xml configuration for Hadoop YARN. This makes the NodeManagers avoid checking the virtual memory entirely and instead rely on resident set size to check memory usage among containers. Q: How do I upgrade my existing instance? A: This is a complex question. Generally, one can use the refresh option to upgrade the version of an extant AsterixDB instance. However one must be cautious- we do not guarantee ABI compatability between releases. Therefore extreme caution should be exercised when attempting to upgrade this way! Q: Does AsterixDB work on YARN for Windows? A: In general, yes! It has been done without much real issue. However it is a infrequent use case, so expect the deployment to have some hiccups. We’re always listening on the users@asterixdb.apache.org mailing list for any issues.